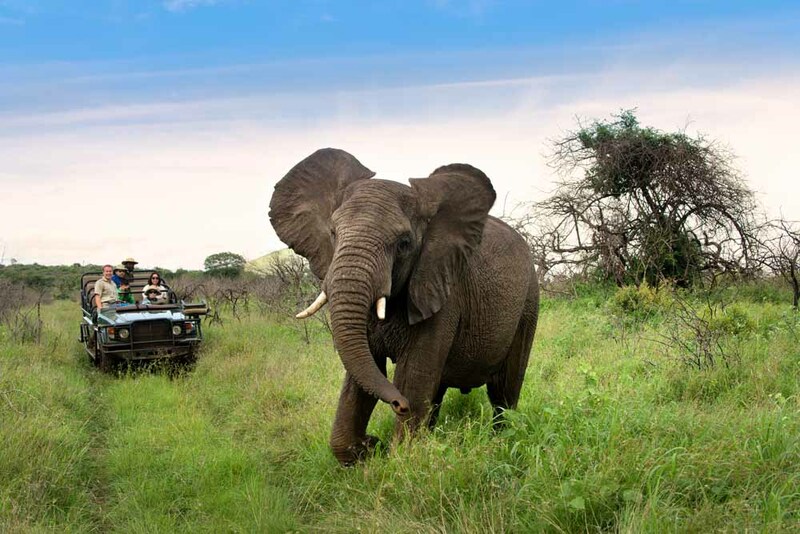 An elephant makes its presence known at Phinda Private Game Reserve. A stretch of giraffes graze on the Okavango Delta, a vast swathe of wilderness that’s teeming with life. 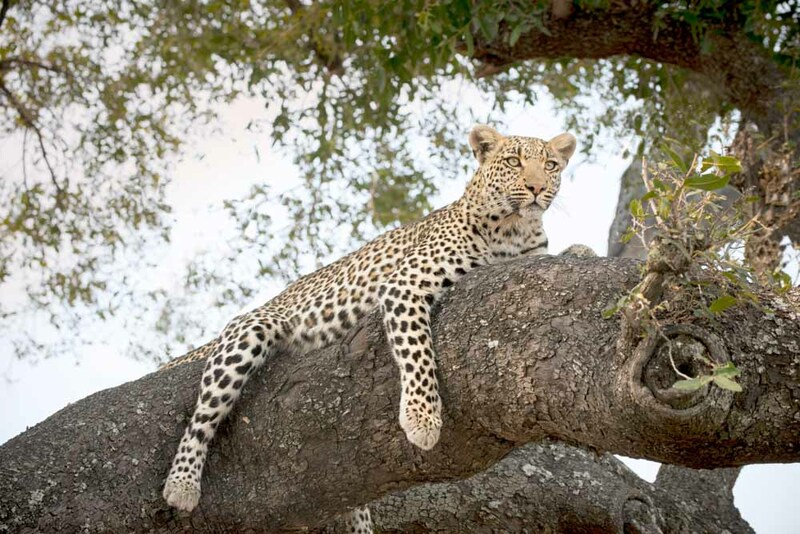 A watchful leopard rests in the Okavango. 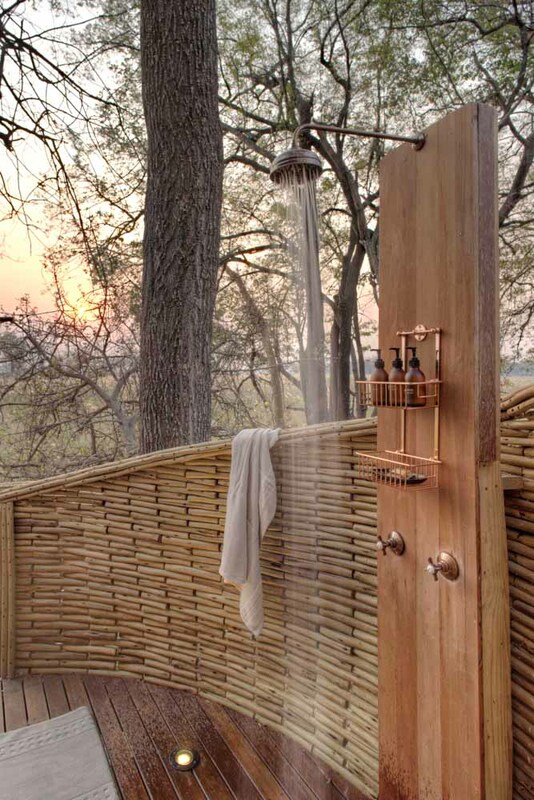 Safari perks; a shower with a sunset view at Sadibe Lodge. It’s a real privilege to get so close to an apex predator like this in the African wild. Gin and tonics in one hand and binoculars in the other. Safari in the Okavango. Elephants cool off at one of the Delta’s many waterholes. Botswana. 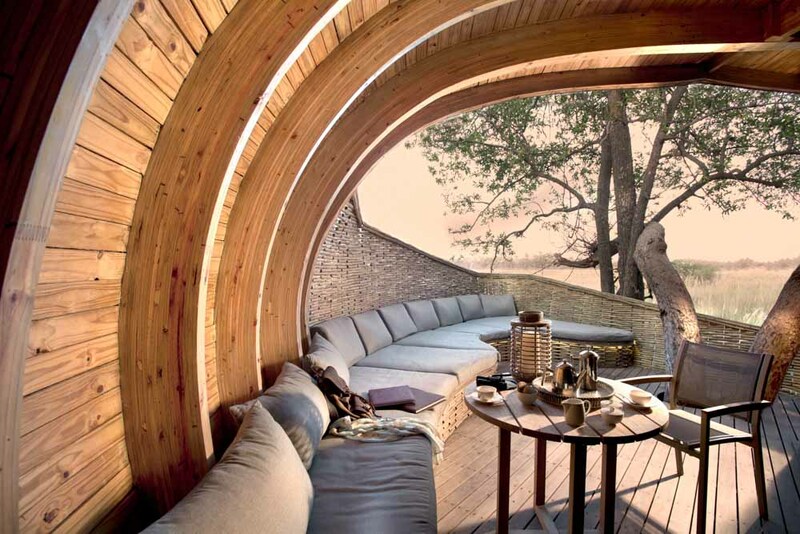 Safari in style; the curving form of Sandibe’s main lodge. 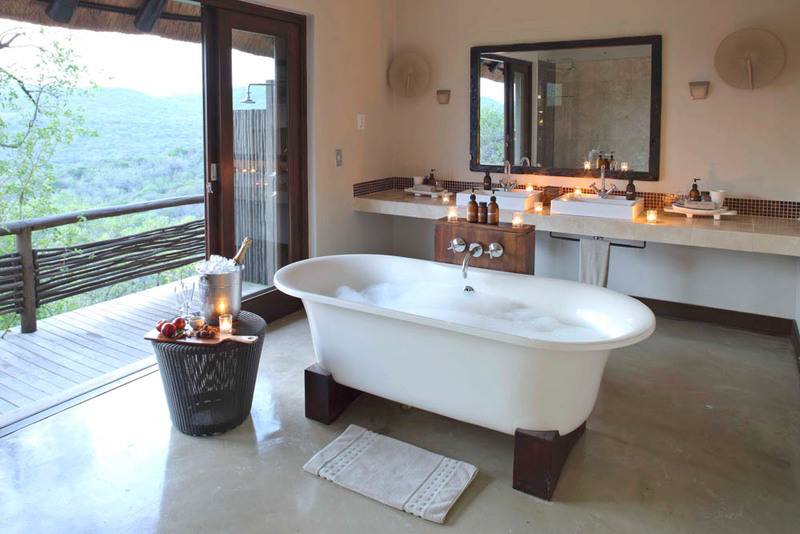 A bath with a view at Phinda Mountain Lodge in South Africa. Taking the whole family with you is the ultimate way to see wild Africa and give kids childhood memories they’ll never forget. Words by Sally Webb. A stubbornness of rhinos. A thunder of hippos. 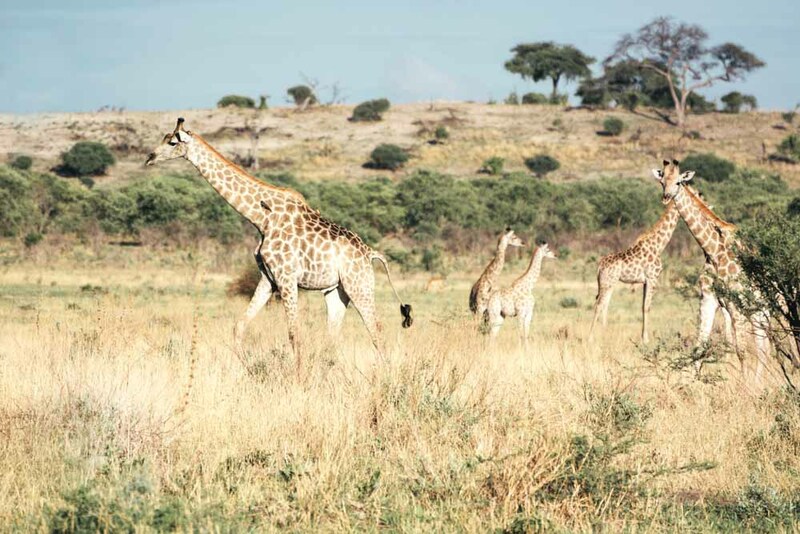 A stretch of giraffes. I never realised quite how entertaining the collective nouns for Africa’s incredible wildlife could be. Nor did I know that leopards (a leap, in case you’re wondering) and cheetahs (a coalition) have almost identical footprints, except for the claws. Or that elephants (a parade or my favourite, a memory) show their stress levels by swishing their tails when they’re relaxed or having them protrude horizontally from their rumps when they’re stressed and likely to charge, so get out of the way. We’re on a safari holiday in the Okavango Delta and every incredible moment is teaching us something new. 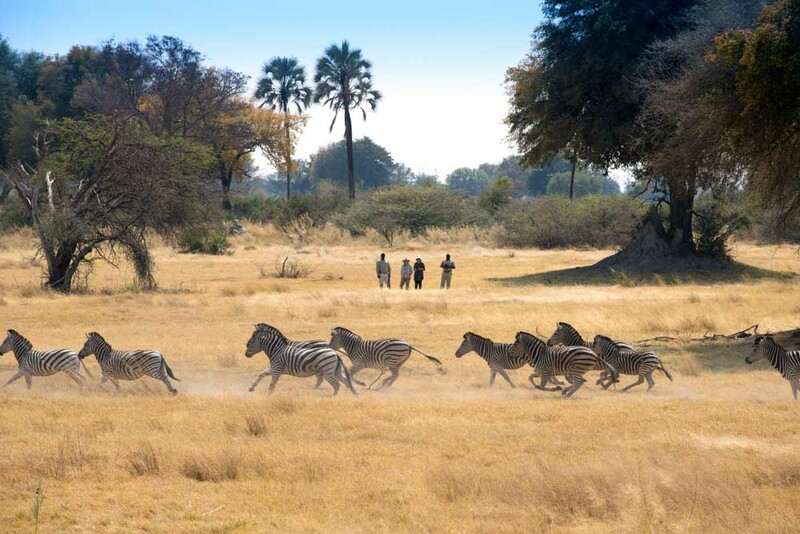 Our trip – to Botswana and South Africa and including two contrasting safaris plus time in Johannesburg and Cape Town – is the realisation of a long-held bucket list dream. And in celebration of a significant birthday we decide to do it in comfort and with a dash of style, travelling with &Beyond to Sandibe Camp in the Okavango and later to Phinda Private Game Reserve in South Africa’s KwaZulu Natal. It pays to travel with experts in Africa; the logistics of getting to the national parks of Botswana and South Africa can be tricky. From Johannesburg we fly to the town of Maun in Botswana, where we transfer straight on to a Mack Air single-engine Cessna Grand Caravan, which operates like a bush taxi in these parts. We fly low over sandy floodplains peppered with shrubs and trees, shimmering waterholes, rivers and creeks that snake through the landscape, and the occasional grey moving dot, which we realise are elephants. We arrive at the remote Chitabe airstrip (which services Sandibe and one other camp in the Delta) to be greeted by Gift, our ranger for the next three days. The welcoming committee includes giraffes (a ‘stretch’ to those in the know) languidly chomping their way through bushy shrubbery. We bump and roll over sandy tracks – a motion to which we’ll become very accustomed during our stay – to Sandibe. There’s been a camp on this site for decades, but a recent redesign has created a stunning, more permanent bush lodge, nestled among wild palms and gnarled fig trees. The guest area resembles the form of a pangolin (or scaly anteater) with a shingled roof mimicking its scales and one side completely open to expansive views of the Delta. The organic design of timber, bamboo, indigenous basketware and carvings continues into the guest suites, with beds framed by romantic nets, pot-bellied stoves for the cooler months and indoor and outdoor showers. Our family suite is, in fact, two separate rooms connected by a long covered passageway. In their own room the kids feel far enough away to be independent but close enough to be safe. They baulk at the idea of skinny dipping in their private plunge pool, but the water becomes a blessing in the intense summer heat. The excitement is palpable as we prepare for our first game drive, donning the long-sleeved pale khaki shirts and netted fishing hats I’d bought to fend off both the raging African sun and mosquitoes. Dressing right is part of the safari experience. 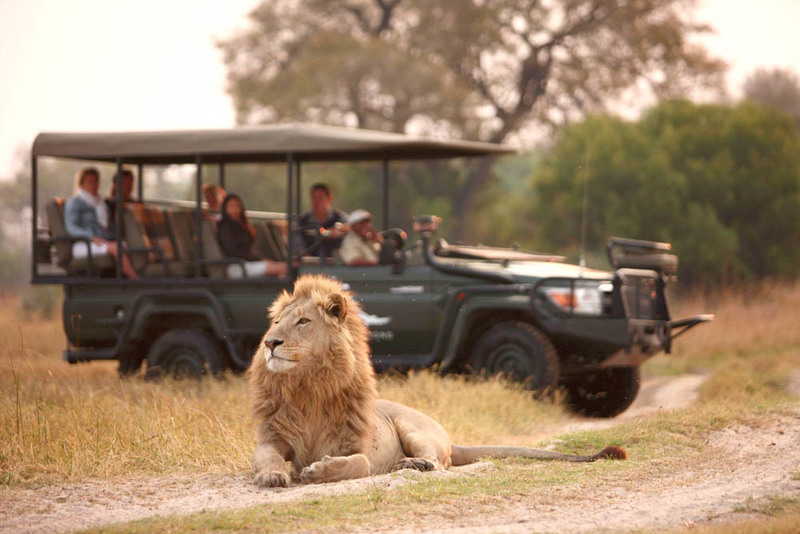 Not only does it guarantee fabulous photos but the natural tones – taupes, greens and browns – mean safari vehicles are seen by the wildlife as a single object so they’re less likely to bolt. We set off with Gift behind the wheel and tracker Sama seated at the front of the van looking for tell-tale tracks. Impala and their larger cousins tsessebe are prolific and we spot several clans of skittish warthogs. It’s not long before we come across a parade of elephants marching and chomping their way determinedly through the scrub. 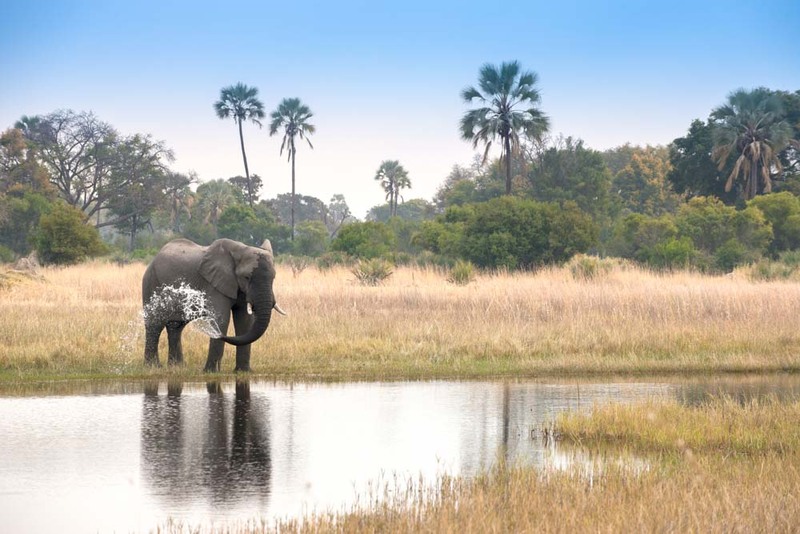 Due to the drought that’s raging across southern Africa, the Delta, which is known for its waterways and waterholes, is exceptionally dry on our visit but we still see abundant wildlife. Elephants are plentiful – the Delta is one of the best places in Africa to see these magnificent pachyderms – and the birdlife is extraordinary. Our favourite winged creatures are the brilliant blue Burchell’s starling and the pretty lilac-breasted roller. Our days at Sandibe settle into a lovely rhythm. Our butler Gora delivers tea at 5am, we head out on a drive having a picnic breakfast as we go, returning for lunch and a siesta or swim, afternoon tea, evening game drive, then back for dinner, which in typical &Beyond style is always impressive and never in the same place twice. It’s more tiring than I had envisaged – given we’re effectively doing nothing but sitting in a van – and tougher on the kids than I’d expected. But the Sandibe staff pay great attention to them, with Gift and Sama joining Archie in bushveld games of palm frond and berry cricket, and elephant poo footy. 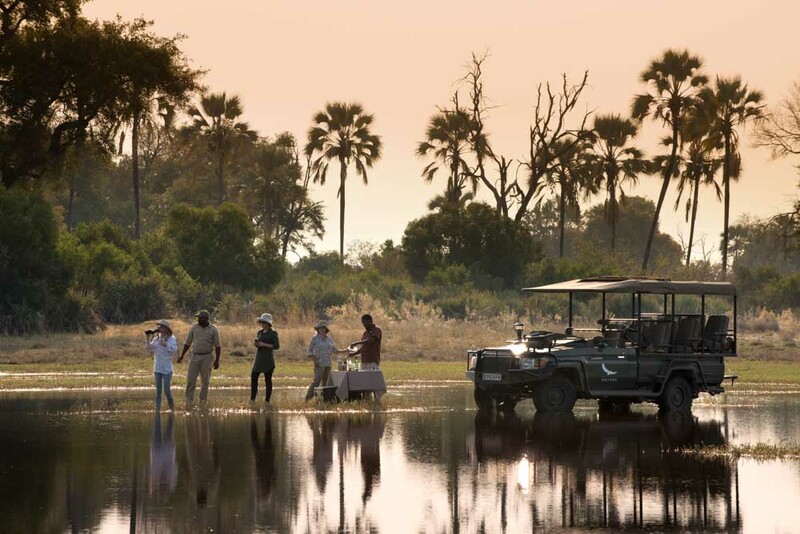 Sundowners become a highlight for all, with Sama revealing he can mix a gin and tonic just as well as he can track elephants or lions. They even teach the kids some African songs so that when the staff break into their spine-tingling tunes each evening, they can join in too. Our list of star attraction sightings grows daily: African wild dogs, chacma baboons, zebra, warthogs, majestic kudu, a lone cheetah, a male and female ostrich, a lioness with four juvenile males, and a young female leopard with an unusually pink nose. The kids’ knowledge about this extraordinary environment grows with every new creature we see. Animal droppings, tracks and other remains tell their own stories of bush movements and survival. From Botswana we travel to South Africa, spending a few days in and around Cape Town before hitting the safari trail again at Phinda Private Game Reserve, three hours north of Durban. After the wildness of Botswana I am slightly concerned that the tamer Phinda won’t stack up. I needn’t have worried: the kids find the bush lessons here even more engaging. Our ranger Amy brings Phinda’s diverse ecology to life. She has the kids cleaning their teeth with the splayed branches of the so-called magic worry tree, like Zulu bushmen have done forever, and introduces Archie to a bird call app that has our digital native enthralled. Her knowledge of the bush and its wildlife is extensive, and if she can’t answer a question she researches it to inform us on the next drive. Our tracker Malusi is a gentle soul whom we nickname the peregrine falcon because he can spot anything, even kilometres away; when we realise one of our cameras has bounced out of the van on rocky off-road terrain where we’d been following a leopard, we return there, hours later in the dark, and miraculously he manages to locate it. There’s great excitement on our first game drive as we head to the reserve’s airstrip to find elephants, a giraffe kneeling in the dirt, and a coalition of playful cheetahs that gets alarmingly close to the wheels of our vehicle. Phinda is a renowned habitat for the heavily poached and endangered white rhino, with a successful breeding program of world renown. We see several of them, and learn that they were originally named ‘wide’ rhinos because of their square upper lip, which morphed into ‘white’ over time. The rarer, smaller black rhino is more difficult to find so we’re elated on our second day when we get a clear view of two of them. We see a lion pretending to be a leopard, climbing up the lower trunk of a tree, and just miss catching a mating pair of leopards in flagrante. Amy explains how lions mate – quickly and multiple times, before lying spent for hours – and how females are known to spread their favours with several dominant males, so that each of them believes the resulting offspring are their own progeny and so allow them to live. Along the way Amy teaches the kids how to operate the radio and has us doing Mexican waves as the 4WD negotiates hills and bumps. Lulu records animal sightings in a notebook that she will treasure forever. One afternoon as we set up for sundowners, Amy brings out poster paints and we graffiti the safari van while listening to African tunes. If I were planning this trip for other families I’d advise them to go to South Africa first, before taking on the wilder, more remote Okavango. But the contrast is enlightening and the wildlife, collectively, is phenomenal. On our return to reality, a friend asks whether children need to be wildlife nuts to enjoy a safari. “No, but they will be by the end of it,” I reply. As well as being experts in those collective nouns. &Beyond Sandibe camp starts from $1296 per person per night or a family suite from $4545 per night (sleeping five). Prices include all safari activities, food and beverages. Additional charges for air transfers and conservancy fees. &Beyond Phinda Mountain Lodge starts from $485 per person per night or family cottage (sleeping up to five) from $1785 per night. Discounts for stays of six nights or more. Book through World Journey.